No better way to end Spring Training than to have these two teams face off. The Bay Bridge Series never disappoints. Both teams happy to be back in the Bay and away from the sweltering heat in Arizona. Many wouldn't think the overcast and freezing fog coming off the water is better but for the Giants it's home. "We're very excited about being home," said manager Bruce Bochy. "The weather started to get really hot out here in Arizona." 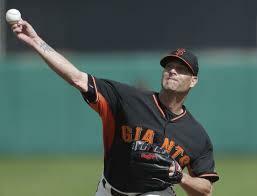 At 56 degrees, Tim Hudson made his debut at AT&T Park. Making his sixth spring start and coming off one of his best starts this spring against the Chicago White Sox, tossing 6.0 innings and allowing only one run. But tonight, Hudson didn't receive the defense he needed in containing the "hot" at-bats from the Oakland A's. The A's shutout San Francisco 4-0 in the exhibition opener. Scott Kazmir bested Hudson who also signed a two year deal. Kazmir pitched for 5 1/3 innings and surrendered two hits both to Hunter Pence. He was simply stellar on the mound walking three and fanning four. "I feel comfortable with all my pitches," Kazmir said. "Threw a lot of offspeed just to get a good feel for them all and had a lot of quality ones." The Giants bats were silent in their home debut. And Michael Morse added to their woes when he failed to execute in left field. Missing two crucial plays proved costly for San Francisco. Morse allowed Josh Donaldson to get the best of him twice. Top of the third, Donaldson's line drive to left field rolled to the back wall past Morse, allowing Coco Crisp to score from first base. "Tell you what, that was a first time for me," said Morse. "I learned a lesson. I won't take any ball here for granted." Morse dropped a fly ball and gave Oakland a 2-0 lead in the fifth when Donaldson hit another line drive to left field scoring Eric Sogard. But it wasn't all his fault, Josh Reddick robbed Pablo Sandoval from what could've been a three run homer at the wall. That certainly would've gotten the Giants back in this game. "If I'd known I was going to give up a home run, I'd have gone only five innings instead of six," Hudson said. "But I figured I'd give Reddick some confidence going into the season." San Francisco still has some decisions to make in regards to their final roster but in the meantime everyone has an opportunity to get better. In this weekend's exhibition series, the Giants have majority of their starters healthy and ready to go. The next two games should be a good matchup between both ball clubs.